Watch heavily loaded aircraft takeoff and make dramatic steep turns to avoid the mountains. Watch skillful pilots land their jumbos on the short 7,054 foot runway! 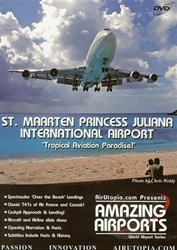 An excellent variety of scheduled and charter airlines serve the airport including KLM and Air France. The magnificent view surrounding the airport including the dangerously close vantage points has made this an aviation enthusiasts' paradise. One can view 747's at the runway threshold before takeoff with a 'Warning' sign posted to warn of the jet blast! This airport is almost as incredible as Hong Kong's Famous Kai Tak. Join AirUtopia as we take you to one of the most exciting airports in the world! Classic 747s of Air France and Corsair!